Tonight in Denver, we bid adieu to auditions and look forward to Hollywood Week. And it couldn't have come at a better time. 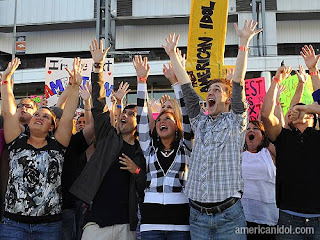 Elizabeth can not take another pre-wrapped package of Idol auditions. Predictable. Predictable. Predictable. We of course had to endure the obligatory ridiculousness of Victoria Beckham, the robotic ways of Kara (following the mindset of those who speak before her), the meaningless over-the-top number rating system by Randy (a system to which the aforementioned robot seems to have adopted now as well), and the fact that Simon is the only one who deserves to have his little keister parked at that judges' table, enjoying a Coca-Cola Classic. With that being said, Elizabeth feels wiped. She feels spent. She feels a bit sad, yet is still optimistic going into Hollywood Week. So she has decided to write a song, set to the tune of Gloria Gaynor's "I Will Survive." She clung to her girl power! Just go back to Journey now. Cause you're not welcome anymore. For someone to be a "Zillion" percent yes? But, I - I will survive. I know Idol will stay alive. I've got all my blogs to write. I've got all my thoughts to share. Hope you enjoyed my ditty. For those of you who love the question wrap-up and the in-depth analysis, I'll squeeze the two together. Did you notice Kimberly's wig right away like me and ah-hem, Simon? Who was your favorite of the night? I vote for Danielle (she ran a karaoke bar and auditioned to Melissa Ethridge's "I'm the Only One"). It was a little rough (like her), but I did like her raw talent. She reminded me of a certain little red head from season 8 (our beloved little Allison Iraheta of course). Were you as embarrassed as I was for Casey James, aka, the guy who took off his shirt for Kara and Posh? Lastly, what was the most ridiculous critique of Posh's? 1) "I like your turquoise. I like your dress. You're really sunny." 2) "You have beautiful skin." (To helium voice girl, Nicki Nix) or 3) "Take down your hair (and clothes) ... You've got a great look." How on earth are any of these relevant?! I'll cut her some slack ... she is a GUEST judge. But Kara, you have no excuse. I say give me Hollywood Week already. What say you? Are you spent? A zillion percent YES to getting to Hollywood already! OMG, I loved your ditty, Bitty!! Is it too late for you to try out with that? I'll pay your plane fare. I think you were right on in your analysis of the four judges. However, you were a bit hard on Victoria. Clearly she has brain damage from wearing her hair so tightly wrapped on top of her head. I was afraid she would topple over. If she ever comes back.......god forbid.....they need to blindfold her, so she HAS to listen to voices. If they don't put us ALL through to Hollywood soon, they are going to lose those of us who actually have some intelligence left. I'm getting dawg tired of this. Connie, I always enjoy your comments. This one, I especially liked the part about Victoria. Tonight, we see the elevator rides of joy or doom w/ the top 24 being announced. Albeit, this episode can be a bit boring, I say hip hip hooray!!! because I, like you, am dawg tired, my dawg-ette. and p.s. you can pay my plane fare, except i won't go there to try out. I would, well, I think you know what I would go there for. I WILL PUT DOWN THAT REMOTE AND I GUESS i WILL GRAB A BEER!! You hit the lyrics of the song right on the nose (LOL)! I can't wait until Hollywood next week. There are great vocals this season and can't wait to see who will make it through to the top 24.